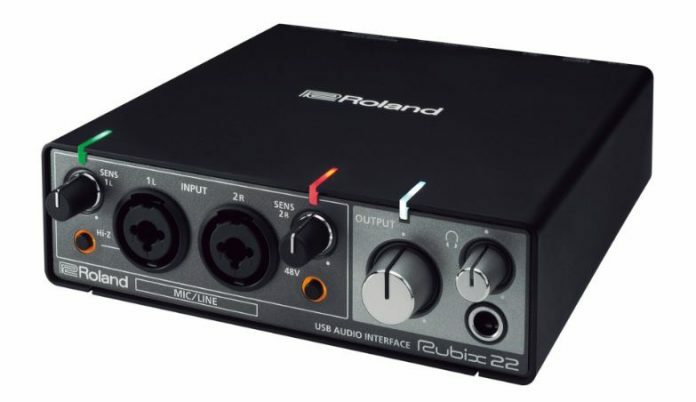 Rubix22 is a 2-in/2-out, 24-bit/192kHz audio interface and it’s part of the newest Roland series of USB audio interfaces. This is their entry-level product, offering a perfect balance of sound quality, compact size, important features and affordability. It is designed for musicians, producers, DJs, sound designers and composers. The front panel shows two combo SLR/TRS inputs, with independent gain knobs. Input 1 supports high-impedance instruments, such as guitars and basses. Both inputs have built-in low-noise mic preamps, with available phantom power. The panel also has a main output volume knob, a TRS phones output jack with a dedicated volume control. The rear panel has a DC connector (adaptor not included), a USB port for both data and power supply, 5-pin Midi In/Out jacks, a direct monitor switch and 2 TRS outputs. The direct monitor switch can be set to mono, stereo or off. Mono is used when one of the inputs is not being used. Off must be selected when monitoring using the DAW software. Rubix22 works with Mac and PC computers, as well as iPads. It will require a dedicated driver when connected to a PC computer. – Includes Ableton Live Lite. The Rubix series also has two more models: Rubix24 and Rubix44.